Marketed by the Impresstik Labels division, the patented Protag™ concept offers an efficient high-speed means of applying roll-fed neck-tags automatically. Protags are dispensed using a unique environmentally friendly liner-less method in either single ply or folded formats. The system is already well-established in the food & beverage areas, including permanent and rental installations of the purpose-built application machine at several bottling plants in Australia and internationally. As part of Impresstik’s commitment to responsible printing, all raw paper materials used are sourced from sustainable paper resources under FSC and EMAS programs. 2. Pyramid Neck Tags – Provides a 360° degree / 4 sided panels of full design and messages to the market. Marketed as a small volume hand applied alternative to the Protag™ concept. 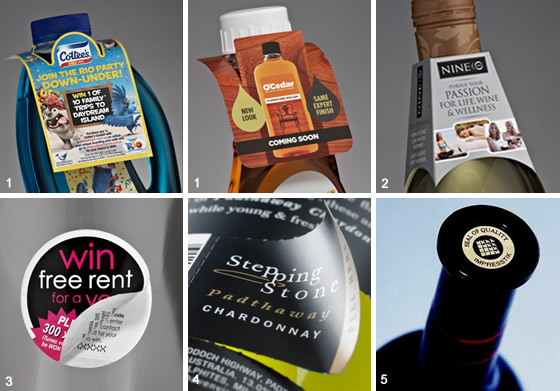 With the growing popularity for on-pack promotional mechanics in a highly competitive marketplace, Impresstik offers a wide range of labelling solutions, including back-printed single-ply labels and multilayer coupon labels. 4. Promo-Lift™ – Impresstik’s Promo-Lift™ label, which provides a perforated removable label ‘section’ to accommodate collectable tokens, ‘instant-win’ messages, brand reminders, or numerous other promotional requirements.